I recently saw a conversation on Twitter about silver screen icons of the present generation. The general idea was that the current crop of Hollywood stars and starlets lack the panache and presence of classic Hollywood icons like Humphrey Bogart, Audrey Hepburn, and Jimmy Stewart. A lot of names were mentioned as possible icons from the current batch in Hollywood. The name that I put forth was Tom Hanks, who turns 56 today. You see, not many actors have played as large a role in my personal movie-watching experience as Tom Hanks has. 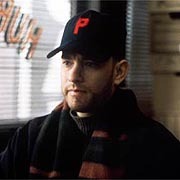 The role that changed everything for Hanks- Philadelphia. 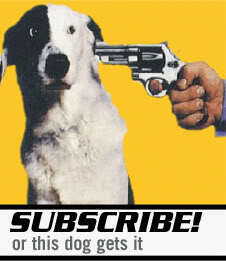 Before I had even reached high school, I had seen Splash; The Money Pit; Dragnet; Big; The ‘Burbs; and Turner and Hooch. I saw half of those on the big screen, and thoroughly enjoyed all of them. After Big, I started to recognize who he was, and decided that I should watch whatever else he would make. Tom Hanks was sort of the first Hollywood star that I recognized and sought out. Then my high school years brought Joe Versus the Volcano, A League of Their Own, and Philadelphia. A League of Their Own spoke to my inner baseball and history nerds, while Philadelphia spoke to my inner liberal. By that point, he had firmly established himself as one of my favorite actors. Then came my college years, which were the years that saw Tom Hanks explode on the national scene. The first movie I saw as a college student was Forrest Gump. Hackneyed sentimentality or not, I enjoyed the film immensely at the time and even went to see it twice since it was free. Then came Apollo 13, Toy Story, and Saving Private Ryan. I saw Toy Story with my niece, who was 5 at the time. A whole new generation was getting an introduction to my generation’s most likable actor, and that made it more special for me. 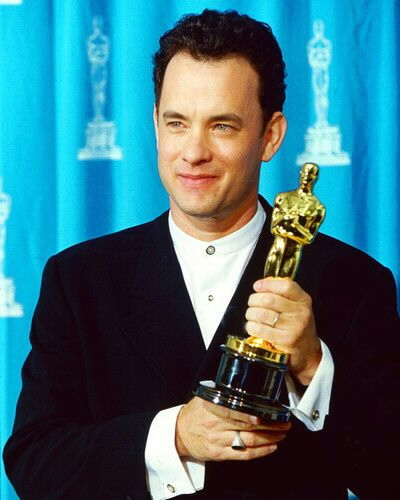 Hanks in a very familiar pose- holding an award. Even into my adulthood, in my post-graduate years, Hanks has continued to amaze. He remains the kind, trustworthy, generous uncle of every movie-goer born from 1960 until 2005 or so. His career has dovetailed with my life, and he has provided quality throughout. 15 of the 24 Hanks titles that I’ve seen have been nominated for either a Golden Globe or an Oscar. He has personally had five Oscar nominations, two Oscar victories, seven Golden Globe nominations, and four Golden Globe victories. The AFI awarded him a Lifetime Achievement Award in 2002. As a producer, he made Band of Brothers, my favorite miniseries. In the kindest, most unassuming and respectful way, Tom Hanks’ career has dominated my lifetime. It’s become vogue in recent years to needle his likability, particularly with the elderly, because of the sentimentality of his films. Basically, he’s viewed in some circles as the actor equivalent of friend and collaborator Steven Spielberg. That’s all well and good but it’s not really fair because he has made an effort to avoid being typecast. For instance, Private Ryan was awfully visceral. He was anything but likable in The Ladykillers and Charlie Wilson’s War, at least not in any sort of dopey sentimental way. He played a mafia killer in Road to Perdition and slightly bumbling but hardass FBI agent in Catch Me If You Can. Of course, all of the opinions are moot. After growing up on his movies for 28 years, there’s little that can be said that would sway my overwhelmingly positive opinion of Tom Hanks. For my money, he’s as close to a living legend as we have today. Happy birthday, Mr. Hanks. Always enjoyed Hanks. Except in Larry Crowne. I absolutely loathed him for 90 minutes while watching that, then when the film was out of my system I went back to loving him. I haven’t seen that one, and I’m not sure I will. I’d hate to have Hanks’ reputation take a hit. I’m honestly not much of a fan of Hanks’ more serious roles. My favorite movie of his will always be The ‘burbs. Both Big and Turner and Hooch were very memorable theater trips for me when I was a kid. Just like Spielberg, I kind of have a love/hate relationship with Hanks, I loved him in the 1980’s comedies you mentioned. I loved his part in Catch Me If You Can, a film I immensely appreciated but his presence in the Dan Brown vehicules, mostly because I don’t like Ron Howard much got on my nerves. Those Dan Brown movies are some of the small group of Hanks films I haven’t seen. The others: Punchline, You’ve Got Mail, Sleepless in Seattle, Bonfire of the Vanities, and That Thing You Do. Maybe a few more I’m not thinking of right now. Didn’t like The Terminal but Hanks is hard not to love. Forrest Gump is about as iconic as they come! I’m kind of a weirdo because I actually liked the Terminal. Dave Enkosky, who’s a regular reader/commenter here, will no doubt give me flack for that confession. It was flawed, to be sure, but I didn’t hate it and I sort of expected to hate it. Obviously Hanks is the more endearing persona on or off screen, but I truly think he’s one of the most talented actors alive. Cruise is good, don’t get me wrong but Hanks rules all. I struggle a lot with Cruise. His earlier films were very solid, but I haven’t cared at all for anything he’s done for a very long time, with the exception of Eyes Wide Shut. Great tribute John, I think he IS a living legend. He’s so freakishly talented, but he’s got such a charming personality to boot. Even in animated features, that playful, friendly attitude came through in his voice over work. I know it’s sort of cliche to say that he’s our generation’s Jimmy Stewart, but I think there’s a lot of truth to that. Hanks is a legend. You are right. I would like to see him in a Tarrantino film or something really gritty. I worry he is a bit M.O.R now. We re watched Forrest the other night, still love that film. A Hanks/Tarantino film would be crazy in a great way. Aside from Larry Crowne, which I haven’t seen and have heard bad things about, I think Tom Hanks is great at picking amazing roles and brilliant films. Now he is at the peak of his career, he doesn’t seem to pick a bad film and I’ll actually seek out a film I may not have been particularly interested in because he is in it. Definitely a screen icon for the modern audience. He’s the anti-Johnny Depp, who I think is an amazing actor but he chooses some questionable films, often in in the interest of proving that he has a lot of range. Great comparison. Though does Johnny Depp have range or does his “make-up” do a lot of the work for him? That’s a fair question. I think it’s him, personally. I think of his roles as Hunter Thompson, Donnie Brasco, or William Blake (in Dead Man) as perfect examples where there wasn’t a lot of makeup and he did a great job.